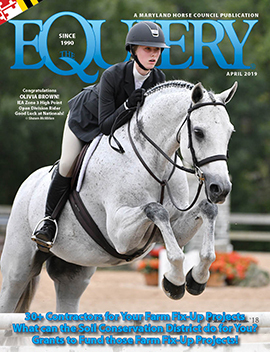 The arrival of March in Maryland brings tantalizingly warm days (alternating with reminders that winter is not yet behind us); mare watching (mares have no respect for either “on time” or daytime); fox chasing; and plans for tailgating at those spring equestrian events. legislative initiatives, many of them arcane and narrowly focused. The final month of the session – especially the last two weeks – is usually so frantic that many serious students of public policy question whether a single, 90-day legislative session can adequately address the many issues that come before the General Assembly each year. Their argument is that with government’s role in today’s society being so expansive, 90 days does not permit reasonable and comprehensive debate on matters that often have significant impact on budgets and taxes, not to mention the fundamental question of what government should and should not attempt to do. Others, less enamored of the desirability of more government (in legislative or any other form), would keep things the way they are or further minimize them. Indeed, there is a wide disparity between states when it comes this matter, with many adhering to the long-held American ideal of the citizen legislator and a part- time legislature, while others have made their legislators and legislatures virtual full-time activities. Maryland, despite its reputation as a “big government” state, has never seriously entertained the notion of amending the state’s constitution and extending the regular legislative session. Thus, we are left with the annual spectacle of March Madness followed by April Absurdity in Annapolis, with the attendant last-minute maneuvering and latenight voting sessions in which some bills get left behind simply because of volume overload. The ending is rarely a thing of beauty and is followed by massive sighs of relief from exhausted legislators and staffers. Will 2006 be any different? Of course not. It is true, as we have noted before, that election year sessions have their own unique dynamics, with both the governor and legislators desirous of doing positive things, like giving away money if there is any to give away and, more importantly, doing nothing to give their opponents something to use against them in the upcoming campaign. Occasionally, though, something arises during a session that stirs enough public interest to demand legislative attention to a sticky, complex issue. The 2006 session suddenly has one of those, sparked (pun fully intended) by the emerging realization that home and business energy costs are likely to rise dramatically this summer when the caps on price increases now in existence expire. On March 7, the Maryland Public Service Commission announced rate increases for the major utilities in Maryland (BGE and Pepco) that ranged from 38% to 72% (BGE) in average annual increases for customers. By the next day, there were legislative proposals to deal with this “crisis” littering the State House. Remember a few years ago (1999), when there was considerable debate aboututility “dereg” in the Maryland legislature, with its proponents arguing that deregulation would permit more competition among utilities and result in more stable energy supplies at reasonable market prices (the only serious variable being the price of oil)? Opponents countered that, far from inducing competition, de-regulation would simply hasten the consolidation of utilities and leave consumers at the mercy of ever-larger corporations with few local constraints on their pricing structures. Who was right? Well, the answer may vary somewhat from state to state, but there is a lot of near-term evidence to support the naysayers, at least in Maryland, where the state’s major utility holding company, Constellation Energy, parent company of BGE, is about to be absorbed by an out-of-state entity and rates are seemingly on their way northward – alarmingly so. In fact, even before the climb in crude oil prices last year, those rates appeared likely to rise by 30-35%; now, the number could be more like the aforementioned 70%, and government officials at all levels are sounding the alarm. The fact that many of these officials were among those who voted for deregulation has, thus far, not been a source of conversation, although that is why we have campaigns and elections. So what happens next? Are we, the consumers of power, destined to a summer of higher thermo- stats and open windows, reminders of just how captive we are to oil imports? Or will the legislature attempt to put in place measures that will cap rate increases once again? There were, at press time, a number of bills being considered that would – belatedly, in our judgment – try to at least partially put some sanity back into the utility pricing market. One problem, among others, is that the BGEs of the world have become sellers of a product they no longer produce. The holding companies now own the means of production, the generating plants, and the local utility is, effectively, a customer of its own parent, which is busy trying to maximize profits by selling electricity or natural gas at whatever the market will bear, on a multi-state basis. Remember those brown outs and spikes in prices in California a few years ago that frightened consumers, drove up their energy costs, and led to a recall of Governor Gray Davis? Welcome to the world of electrical de-regulation. Brown-outs and recalls may not be on the table in Maryland, but sharply higher energy prices are, and it is evident that the legislature is in a pickle trying to figure out how, in an election year, it can slow the flood that it started, how- ever inadvertently, seven years ago. This is not a simple problem, nor one unique to Maryland; but it IS a problem for all who are paying those “new world order” rates, starting this summer. Energy prices are not the only “big picture” issues being discussed in Annapolis this session, with identity theft, stem cell research, health care mandates and, recently, the national noise over the operations of major United States ports (the port of Baltimore being one of those) also getting a lot of attention. Horse related legislation? As stated in last month’sEquiery, the Maryland Horse Park is not going to be a legislative priority this year, largely because Anne Arundel County election year politics have become the overriding consideration. In essence, retiring County Executive Janet Owens decided to leave it up to her successor, and those running for that office have chosen either caution or grand- standing where the Horse Park is concerned. If you are a horse person in Anne Arundel County, make certain you let the candidates for county executive know where you stand, and make certain you know where they stand. For those who oppose it, this is a perfect example of opposition to an idea based on lack of assessment of its merits. The Horse Park’s future is almost certainly going to be tied to the continued support of the industry for the project, which has moved much closer to reality with the efforts of the Maryland Stadium Authority to develop the economic and aesthetic rationale for the park. The racing industry bills, of which there are many, are almost certainly going to follow their normal path, which is being held up until the final days of the session, when the budget is set in stone. There is a $10 million dollar item in the governor’s budget that would provide supplements to both Thoroughbred and Standardbred purses and breeders’ funds. This was, as many of you will remember, a practice for a four-year period in the late ‘90s, and with the state running a significant surplus for the upcoming fiscal year, there is both the money and the will to provide this assistance, at least for next year. But it may well become a victim of the process now earnestly underway, where the legislature exercises its prerogative to cut items from the budget. Since the General Assembly can only slice the budget, not add to it, this is the time when the legislature tries to do some horse trading with the administration, and the $10 million for purses and bred funds is one of the targets for manipulation. The racing industry’s pre-disposition to take its internal disputes to Annapolis has sometimes acted as a barrier to gaining legislative support for such measures, and that, too, could influence the outcome of this particular discussion. industry can come to a revenue sharing arrangement that will bring peace for the foreseeable future. The legislature does not want to referee this fight, which has been with us since the mid-’90s. There are at least 16 bills still technically alive that deal with expanded gambling/slot machines. It is rare that so much time is spent drafting and introducing so many bills about one subject when there is absolutely no buzz about the issue. It is as if those who have been in the thick of the slot machine conversation over the past several years have simply decided to continue pushing the button, regardless of immediate prospects, or lack thereof, for success. the governor’s office to those of the legislative leadership to the rank-and-file legislators. Clearly, the goal of slots proponents is to keep the issue in front of people with the thought that a post-election world will determine the course of future slots legislation. O’Malley, who is the current leader in the polls when pitted against Duncan in the primary or against Governor Ehrlich in the general election. O’Malley has suggested that he favors slots, but without defining his position in terms of where or how many or revenue distribution or anything else, for that matter. The betting in Annapolis is that an O’Malley governorship will position slots legislation more favorably than has been the case, and the re-election of Governor Ehrlich will certainly assure that the debate continues, if nothing more. As for other horse related legislation, the bill to extend the Maryland Horse Industry Board’s life is on a track to passage, as is probably the Horse Transport bill initiated by Delegate J.B. Jennings that would, as the title implies, set standards for horse transportation in the state. Jennings also introduced HB 840, titled Agriculture–-Infectious and Contagious Diseases–-Notice of Quarantine. The delegate, like many people involved in the horse industry professionally, found the information flow surrounding Maryland’s recent equine herpes outbreak to be confusing and belated in its arrival. His bill would establish certain notification requirements that would be administered by the Maryland Department of Agriculture in the event of infectious disease outbreaks. Delegate Jennings has done the industry a service by introducing this bill, because it highlights an ongoing issue regarding timely and adequate notification of the state’s equine industry regarding the latest information pertaining to such outbreaks. There has been widespread concern, and even more misinformation, about the most recent outbreak, and it is fair to say that both the Maryland Department of Agriculture and the industry have, hopefully, gained new insights into how to gather and direct information to horse owners and equine facilities operators in Maryland. MDA opposes the specific language of the bill, not its intent, because it feels that the requirements set forth are too rigid and would not be applicable to the variety of circumstances surrounding infectious disease out-breaks. At the same time, MDA appears to understand the need for improving reporting procedures and information flow, and the formation of the Equine Health Advisory Committee under MDA auspices should facilitate the development of an information network that will get the word – whatever it is – out more quickly. On a broader front, efforts to provide estate tax relief and to establish clear requirements (and limitations) for state and local governments to claim property by right of eminent domain for economic development purposes seem poised to pass in some form. If crafted well, they should be beneficial to the farm community, or at least not harmful. The devil, of course, lies in the details, and as we have learned with utility deregulation, it can be a devil of unintended consequences. Your electric bill, starting this summer, is going to be a powerful reminder of this old adage. Editor’s note: Timothy Capps is the former executive vice president of the Maryland Jockey Club and, before that, the Maryland Horse Breeders Association. He is currently working as a consultant in the industry.